Thank you very much. We had a terrific holiday and we were well looked after by Fuat. 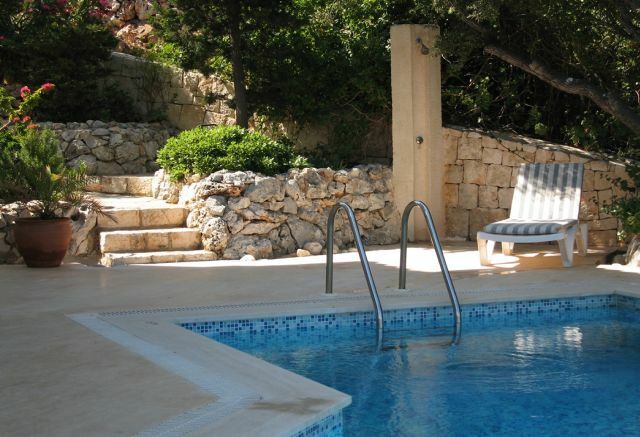 The villa was really well equipped and as always it was super to be back in Kas. Just thought I’d drop you a line to say we arrived safely home yesterday and everything went like clockwork. The villa was as good as last time and we’ve had a great holiday. It was a bit hotter than usual for the time of year and the town was buzzier than when we’ve been there later in September but Kas remains a super town. We did a half day cookery course learning how to make Mezzes which was superb. If you think any of your other guests may be interested I can send you the contact details for Louise who runs them at her house up in the hills above Kas. I think we left everything in good order, so look forward to the return of our deposit in due course. Thanks again, I’m hoping it won’t be the last time we visit! the whole family loved the place, no doubt we will go back again. thanks for all your help. Lovely out in Kas at the moment! Wonderful home, spectacular view, lovely service. We spent 1 week in this villa with our 2 young children. 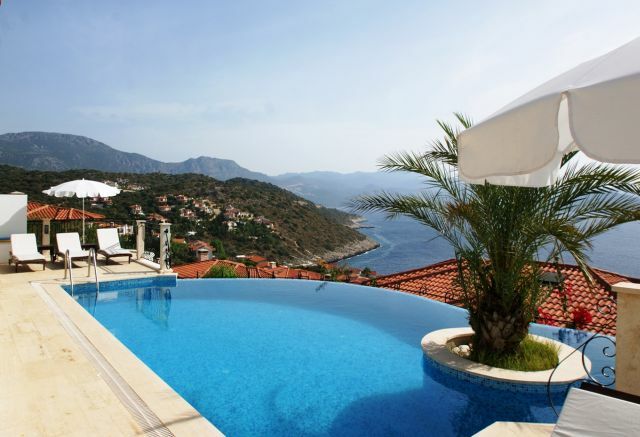 Very nice villa, the view on the sea from the terrace and the pool is just amazing. It’s located at the extreme end of the Kas’ peninsula. It’s only 5km away from Kas center. Good place to access all the best beaches (patara 40 min, kaputas 20 min) and some historical places (Olympus and Chimera 2h). The day on a boat to visit Kekova bay is a must-do like the visit of the Greek island of Meis (don’t forget your passport to travel to Europe!). The stairs to the sea behind the villa gives access to an old platform in not good conditions. Not a big deal for us, we didn’t use it as the sea was very wavy due to the strong wind in the afternoon. We recommend this location without hesitation. We stayed for ten days mid July. 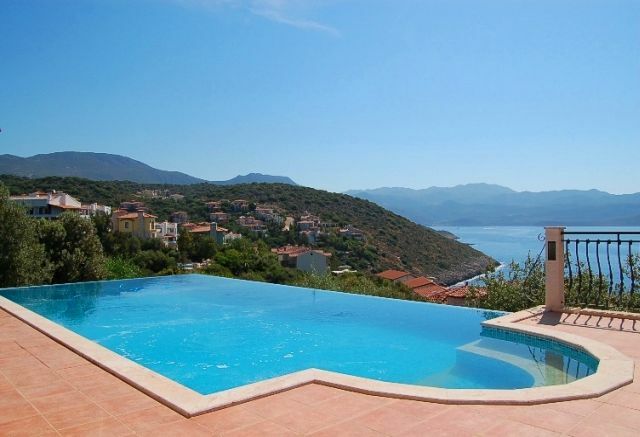 Villa was beautiful with spectacular views across the sea. Lovely and peaceful also. There were about 100 steps down to the sea platform, but the steps into the sea were broken away so we climbed across a couple of rocks to the sea platform next door which belonged to the hotel and could get into the sea from those steps. However we only did this once as the sea was quite rough and choppy most days and thought it may be dangerous. Fuat, the villa manager was very helpful and left fresh bread for us every day. A car is essential as there are no shops on the peninsular, although there is a bus service into town every half hour, but even so in the heat you do not want to be carrying heavy shopping bags!. Beware of the very steep lane to the villa if you are driving though! We would definitely visit again. We thoroughly enjoyed the villa – what a gorgeous view and stunning peace and quiet which was just the ticket for us. We were pleased to see that there was everything that was needed to be able to make a good meal, which in our experience is quite rare – plenty of pots, pans and utensils and the villa itself was spotless on arrival and I hope, upon our leaving. The information pack was really helpful and informative and the welcome pack was indeed very welcome on arrival, so thank you for that. ” In the last 15 years we have stayed in many villas in mainland Spain, the Balearics, Greece and the Caribbean. 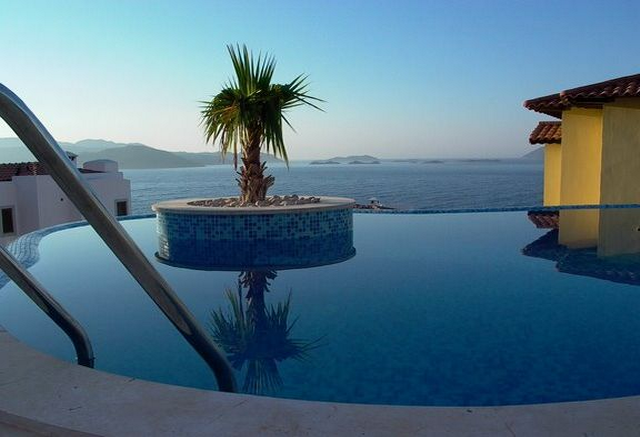 In terms of facilities, pool, view and easy access to the sea, Villa Athena was definitely one of the best. We had a wonderful week and enjoyed exploring Kas, Kalkan and further afield in our excellent little car.I have already recommended you to family and friends and would be very happy to write something on your website or Tripadvisor if you wish. (I used to write travel articles for various magazines. )Many thanks to you and Guy for a great first week of our holiday. We had a lovely relaxing 2 weeks holiday thanks. It’s such a lovely place with lovely people. Pass on our thanks to Bayram who helped us out especially when I lost the hire car keys! Thank goodness they were handed in and returned to hire company. The villa was lovely. We had a really really lovely second week. It could only have been improved perhaps by the option of having bikes! 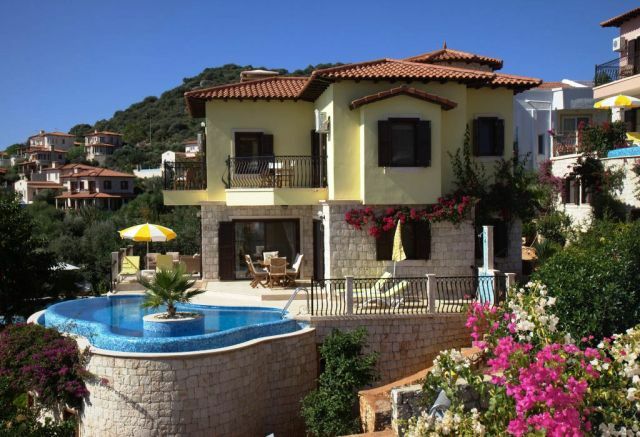 We did have a car but having had use of bikes (albeit in a slightly less frenetic setting during the first week) we found that we loved the freedom and thought your villa would benefit! Wouldn’t hesitate to recommend your villas. We really enjoyed our stay at the Villa Irena – such a lovely place with the most beautiful view! And we all became friends with Tikka – she’s cute. We all hope to come back some day. First time in Kas, first time on holiday with the family (6). Its one of the highest on the island and waking up to the sound of birds, perfect settings and the fresh breeze while looking over the most Beautiful breathtaking views, was special. Will defo miss it and will definitely be returning. All questions answered and served whether it was a hire car or just general info. Mamet brought fresh bread for us every morning. The kids have never been so happy! Thanks Lindsey for everything, it was an absolute pleasure! Until the next time…..?? ?